"Observations show that glaciers around the world are in retreat and losing mass. Internationally coordinated for over a century, glacier monitoring activities provide an unprecedented dataset of glacier observations from ground, air and space. Glacier studies generally select specific parts of these datasets to obtain optimal assessments of the mass-balance data relating to the impact that glaciers exercise on global sea-level fluctuations or on regional runoff. In this study we provide an overview and analysis of the main observational datasets compiled by the World Glacier Monitoring Service (WGMS). The dataset on glacier front variations (~42 000 since 1600) delivers clear evidence that centennial glacier retreat is a global phenomenon. Intermittent readvance periods at regional and decadal scale are normally restricted to a subsample of glaciers and have not come close to achieving the maximum positions of the Little Ice Age (or Holocene). Glaciological and geodetic observations (~5200 since 1850) show that the rates of early 21st-century mass loss are without precedent on a global scale, at least for the time period observed and probably also for recorded history, as indicated also in reconstructions from written and illustrated documents. This strong imbalance implies that glaciers in many regions will very likely suffer further ice loss, even if climate remains stable." Thanks for posting this Lennart. As I understand it mountain glaciers aren't large enough to have much effect on ocean level. Those downstream however that rely on glacial melt for water will have big problems. As coastal dwellers move inland away from rising waters and mountain/valley people move to avoid water shortages, those with a regular water supply that aren't threatened by SLR may have to fight for their traditional lands. Central Asian glaciers have melted at four times the global average since the early 1960s, shedding 27 percent of their mass, according to a recent study. By 2050, warmer temperatures driven by climate change could wipe out half the remaining glacier ice in the Tien Shan mountain range, reported the study, published in Nature Geoscience. At stake is a critical source of water for people in Kazakhstan, Kyrgyzstan and Uzbekistan, as well as a section of northwest China. Glaciers in Western Canada continue to melt at an alarming rate, with researchers recording a five-and-a-half metre ice surface loss on the Athabasca Glacier in the past year. This is an incredible opportunity, since the artefacts found on the glaciers are so well-preserved. It might be counter-intuitive, since nobody (except Inuit) lives on the ice. But people walked it, travelling (Ötzi), hunting (Norway, Canada), making sacrifices (Peru). Problem is, once melted out, organic stuff decomposes quickly. So this is a race against time. Assessing the impact of glaciation on Earth’s surface requires understanding glacial erosion processes. Developing erosion theories is challenging because of the complex nature of the erosion processes and the difficulty of examining the ice/bedrock interface of contemporary glaciers. We demonstrate that the glacial erosion rate is proportional to the ice-sliding velocity squared, by quantifying spatial variations in ice-sliding velocity and the erosion rate of a fast-flowing Alpine glacier. The nonlinear behavior implies a high erosion sensitivity to small variations in topographic slope and precipitation. A nonlinear rate law suggests that abrasion may dominate over other erosion processes in fast-flowing glaciers. It may also explain the wide range of observed glacial erosion rates and, in part, the impact of glaciation on mountainous landscapes during the past few million years. Tropical glaciers in the Andes are melting at their fastest rate for 12 years, thanks to the record-breaking El Niño that is warming up the area, according to new data analysed for New Scientist. This is compounding the already high melting rates from global warming that will consign many glaciers to history within decades. “The lower-level glaciers in the Andes, below 5500 metres, are really endangered now and probably only have a couple of decades left,” says Michael Zemp, director of the World Glacier Monitoring Service in Zurich, Switzerland. The organisation recently found that the first decade of the 21st century saw the greatest decadal loss of glacier ice ever measured, with melting rates two to three times higher than in the 20th century. This glacier loss will lead to water and hydropower shortages, the destruction of unique habitats home to endemic species, as well as the loss of a unique record of Earth’s past recorded in layers of ice (see box, below). Doug Hardy, a climate scientist at the University of Massachusetts, has recorded the lowest snow accumulation in the 12 years he has been monitoring the Quelccaya Ice Cap in Peru (pictured above) – the largest glacier in the tropics. “We’re seeing 40 per cent more melting than any other year since measurements started in 2002,” he says. Similarly, the Conejeras glacier in Colombia has lost 43 per cent of its volume over the last two years, according to Jorge Luis Ceballos Liévano and his colleagues from the Hydrology, Meteorology and Environmental Studies Institute in Bogotá. More than two-thirds of that loss has taken place since the onset of the current El Niño. The Zongo glacier in Bolivia, whose runoff feeds a hydroelectric power station supplying the capital, La Paz, also appears to be in its death throes. Some glaciers have already melted away. In 2009, the last of the ice disappeared on the 5350-metre-high Chacaltaya glacier in Bolivia – previously the world’s highest ski resort (pictured below). Similarly the ice-covered summit of Pico Espejo in Venezuela became bare rock by 2008. In Bolivia and Peru, which have arid summers, glaciers buffer the water supply and ensure a year-round steady flow. Last year Antoine Rabatel, from the Joseph Fourier University in Grenoble, France, and colleagues showed that during the dry season a quarter of La Paz’s water comes from glaciers. “Right now people don’t realise the urgency of the situation because the fast melting of the glaciers is providing plenty of water,” says Rabatel. In some locations the nature of things to come is starting to become apparent. Retreat of glaciers in the Quebrada Paron mountains of Peru has reduced water flow into the lake below, which supplies a hydroelectric power plant. And it isn’t just people who will be affected. Previous research has found that between 11 and 38 per cent of species could be lost in an area following the disappearance of a glacier. Specialist species such as the meltwater stonefly, whose larvae rely on glacial streams, are likely to start vanishing when half the glacial cover in a region is lost. And slow-growing alpine cushion plants, along with many other species of plant and animal that depend on these mossy pillows, will suffer under increasing temperatures. Even though cushion plants prefer to colonise newly deglaciated land, they will struggle to keep up with the pace of melting. The only bird known to nest on a glacier – the white-winged diuca finch (Diuca speculifera) – may have to keep moving higher to build its nests, until eventually it will run out of places to go. Several teams of glaciologists are rushing to drill into remaining glaciers to preserve a sample called an ice core, and with it record of our planet's past. "Some of these glaciers contain 20,000 years' worth of atmospheric data and right now melting is wiping this record out," says Antoine Rabatel from the Joseph Fourier University in Grenoble, France. "We need to preserve these cores now, so that scientists of the future can still extract this information," says his colleague Patrick Ginot, who is leading a UNESCO-supported project - Saving Ice in Danger - to collect and store glacial ice cores at the Concordia Research Station in Antarctica. Lonnie Thompson, from the Ohio State University, and his team have been hauling their specialist solar-powered drilling rigs up to some of the most inaccessible places in the world since 1983. Just last month they returned with ice cores from the Guliya ice cap in north-west Tibet, which they then store in a specialist unit at the university. "This freezer facility is the only place that the ice from some of these glaciers still exists," says Thompson. These glacial ghosts include lost ice fields on Mount Kilimanjaro in East Africa and those from the rapidly melting Northwall Firn glacier on the slopes of Puncak Jaya in Indonesia. Much of our understanding of global climate is based on the high-resolution record of past atmosphere that only ice cores can provide. The cores from the Quelccaya Ice Cap in Peru, for example, show the medieval warm period when the Vikings settled in Greenland. "You can see the onset of the Little Ice Age in the early 1500s that contributed to the demise of the Vikings," says Thompson. "And you can see the warming in the 20th century." "We hope soon to be able to reconstruct the evolution of things like bacteria and viruses through time by using the ice archive," says Thompson. BEIJING — Glaciologists in China and elsewhere have said for years that climate change is the main cause of glacier erosion, which threatens the water sources of much of humanity. Officials in the far northwestern Chinese region of Xinjiang now say another factor is putting the fragile glaciers at risk: tourism. The Xinjiang government announced this month that it was banning tourism on glaciers across the region, which is one-sixth of the Chinese land mass. Many glaciers are found in Xinjiang, and in the Tianshan range in particular, which runs east-west through the middle of the vast region. Officials want to ensure that tourists observe the glaciers from a distance, not atop the glaciers themselves, according to a report published on Thursday by Xinhua, the state news agency. It quoted Chen Xi of the Chinese Academy of Sciences as saying that glaciers in the Tianshan range have receded 15 to 30 percent in the last three decades. Witness the collapse of the Perito Moreno Glacier in Argentina's Los Glaciares National Park. "...I'm a rock'n'roll star,...... YES I ARE!!!!!!" It is more that it is an indicator of Climate Change. The estimates I've seen are around 1 meter of sea level rise from all the land based glaciers, and about the same agian from thermal expansion. So not a lot in comparison to Greenland and Antarctica, but still enough to count. Although mountain glaciers are not that important with respect to SLR, they have their own set of serious consequences coming for human civilization. I don't think that many people - even those who accept the reality of rapid AGW/CC - realize the dire implications of mountain glacier melt and average snowpack reduction as in California's Sierra Nevada mountains. "More than one-sixth of the world population relies on glaciers and seasonal snow packs for water resources." That's more than one billion people! The origin and primary flow of water for many South American and Asian rivers depends on Andes and Himalayan glaciers respectively, although countries in the lower elevation rain-forest regions of some watersheds can be lightly to heavily supplemented by monsoonal and other tropical rainfall patterns. In a warming world, river flow in some regions will likely increase as glacial melt increases, but eventually decrease as glaciers shrink - lose volume - past a certain point. The temporary increase will encourage population growth and development, but then slam the affected areas later with water shortages. Coupled with "water grabs" via new dams on rivers such as the Mekong, permanent and irreversible flow reductions may already be happening, especially in places such as in China, Pakistan, India, and SE Asia. With a significant increase in atmospheric moisture content capacity with each degree rise in average global temps (7%? ), and a likely shift to more frequent heavy regional precipitation events alternating with droughts that are likely to be severe and extended, we may be on the threshold of some serious civilization-impacting weather events and short-term climate changes. Although SLR will be easy for everyone to see as it kicks into high gear, the quantification of glacier melt on river flows, coupled with the impacts of weather patterns and drought cycles, will be much more difficult to quantify and assign attribution. Glaciers act as indicators of climate change: before sea level rise will be global panic in more than the economy. Where are the Syrians going to run once the Europeans realise the situation in the deserts of the world is being taken advantage of...? Eventually the penny drops once the forecasters come to agree that too many indicators line up to tell only one story. Then people rush to secure their food and drink and everything else supplies. It's geo-politics!! Abstract: "The near-global retreat of glaciers over the last century provides some of the most iconic imagery for communicating the reality of anthropogenic climate change to the public. Surprisingly, however, there has not been a quantitative foundation for attributing the retreats to climate change, except in the global aggregate. This gap, between public perception and scientific basis, is due to uncertainties in numerical modelling and the short length of glacier mass-balance records. Here we present a method for assessing individual glacier change based on the signal-to-noise ratio, a robust metric that is insensitive to uncertainties in glacier dynamics. Using only meteorological and glacier observations, and the characteristic decadal response time of glaciers, we demonstrate that observed retreats of individual glaciers represent some of the highest signal-to-noise ratios of climate change yet documented. Therefore, in many places, the centennial-scale retreat of the local glaciers does indeed constitute categorical evidence of climate change." See also the following article entitled: "Mountain glaciers are showing some of the strongest responses to climate change". Extract: "Overall, the results show that changes in the 37 glaciers' lengths are between two and 15 standard deviations away from their statistical means. That represents some of the highest signal-to-noise ratios yet documented in natural systems' response to climate change. "Even though the scientific analysis arguably hasn't always been there, it now turns out that it really is true—we can look at these glaciers all around us that we see retreating, and see definitive evidence that the climate is changing," Roe said. "That's why people have noticed it. These glaciers are stunningly far away from where they would have been in a preindustrial climate." "
As can be seen above, the Waggonwaybreen glacier in Svalbard, Norway, has retreated substantially since 1900. Svalbard’s glaciers are not only retreating, they are also losing about two feet of their thickness each year. Glaciers around the world have retreated at unprecedented rates and some have disappeared altogether. The melting of glaciers will affect people around the world, their drinking water supplies, water needed to grow food and supply energy, as well as global sea levels. Warming temperatures have rapidly reduced the size of 39 named glaciers in Montana since 1966, according to comparisons released by the US Geological Survey (USGS) and Portland State University. Some have lost as much as 85% of their expanse over the past 50 years, with Glacier national park, site of 37 of the surveyed glaciers, set to lose all of its eponymous ice formations within the next few decades. Of the 150 glaciers that existed in the park in the late 19th century, only 26 remain. An interesting read on Glacier National Park. Glacier National Park is overcrowded. Thanks, climate change. A record-breaking 1 million people visited Glacier in July, up 23 percent from last year. Park officials are stuck dealing with overcrowded parking lots, more medical emergencies, and a shortage of open campsites. While the number of visitors has fluctuated in past decades, it’s been on the rise over the past five years. Some attribute the park’s popularity to low gas prices (perfect for road trips!) and all the envy-inducing photos making their way to Instagram, while others blame our old pal climate change: All but 26 of the 150 glaciers that existed in Glacier National Park in the late 1800s have melted away, and scientists say it’s “inevitable” we’ll lose the rest. Such predictions have prompted a wave of “doomsday tourists” who want to catch a glimpse of climate change in action. China has restricted tourism, and shut down industrial plants trying to save these glaciers. Good story, though could easily be posted in Places becoming less livable thread. Karez, the name for the underground channels bringing glacial water to dry regions is a new word to me. Reminiscent of the ancient qanat from Libya that inspired Qaddafi to build the Great Man-Made River that brought water to so many. It's recent destruction wasn't an accident. A few posts up is a piece about the tourist uptick at Glacier National Park, strange how different governments respond to similar stimuli. N.B. The study excludes the "baked-in" melt of the Greenland and Antarctic ice-sheets. The warming the world has already experienced could be enough to melt more than a third of the world’s glaciers outside Antarctica and Greenland – regardless of current efforts to reduce emissions. Of course, it is impossible that global temperatures would just stop rising overnight. Therefore, the researchers looked at the different rates of glacier melt, according to scenarios of how quickly CO2 emissions are reduced over the course of this century. You can see these scenarios in the charts below, which show projections for global temperature rise (upper chart), rate of glacier change (middle) and total glacier mass (lower). The different colour lines indicate four future greenhouse gas scenarios known as “Representative Concentration Pathways” – and two extra scenarios that specifically represent the 1.5C and 2C long-term temperature goals of the Paris Agreement. At some point the glacier mass loss will drop. Unfortunately that comes about because the total glacier volume has decreased to a small number. Do you know of any site that is trying to track alpine glacier volume? 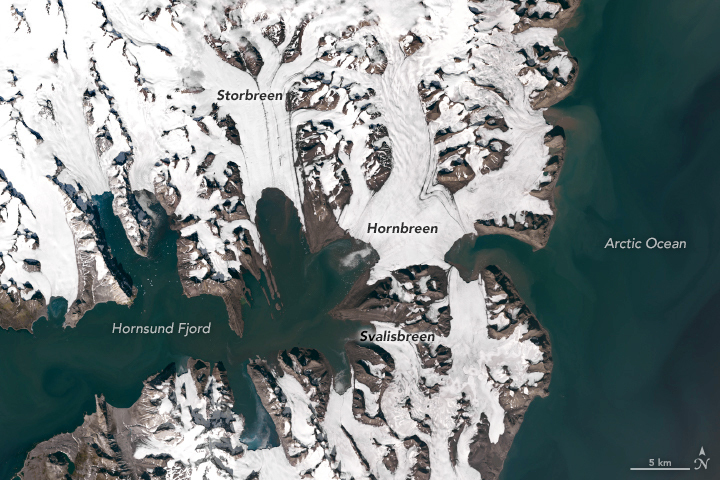 Here's the particular one I've been wanting to share: https://earthobservatory.nasa.gov/images/92325/losing-ice-in-svalbard Losing Ice in Svalbard, dated 25 June. I've copied it here, but the link is better because it provides a dandy little image comparison, and source material, as well as leading to other interesting content. The mass a mountain glacier loses to evaporation, melting, or iceberg calving in the ablation zone cannot surpass the mass it adds near the top. Any imbalance causes glaciers to shrink over time, growing thinner, covering less area, and seeing their lowest edge (terminus) draw back toward the accumulation zone—a process scientists describe as retreat. While other satellite sensors are needed to measure the thickness of glaciers, the natural- and infrared light imagers on the Landsat satellites excel at monitoring changes in glacial extent, snow lines and the positions of termini. Pelto has analyzed several decades of Landsat imagery for glaciers around the world and describes many of them on his blog From a Glacier’s Perspective. One area Pelto has focused on is the Hornsund Fjord region in Svalbard, a remote Norwegian archipelago in the Arctic Ocean. The shallow fjord nearly divides the large island of Spitsbergen into two separate islands. Fourteen tidewater glaciers flow into the fjord, and all of them have retreated substantially during the past three decades. 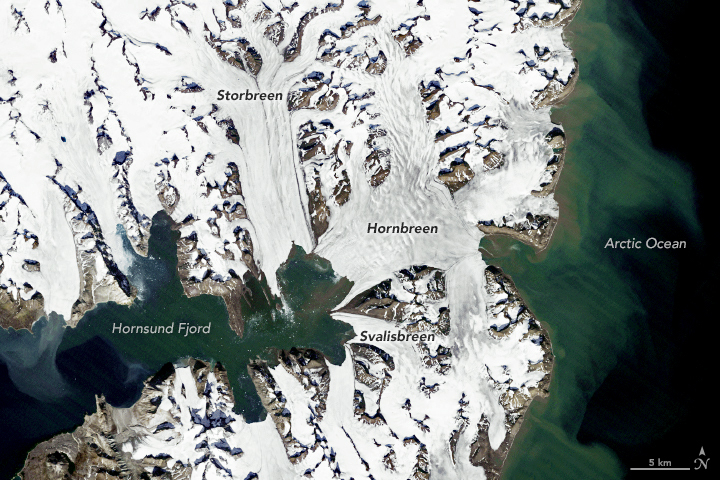 The Thematic Mapper (TM) on Landsat 5 captured a image (top) of Hornsund Fjord on August 20, 1990. The second image shows the same area on August 19, 2017, as observed by the Operational Land Imager (OLI) on Landsat 8. Since the water where Storbreen terminates is quite shallow, Pelto is confident that the glacier is retreating because rising air temperatures are driving the snow line higher up the glacier. In 1990, the snow line sat at an elevation of 400 meters. In 2013, 2014 and 2015, it has averaged about 500 meters. The center of Storbreen’s terminus has retreated nearly 6 kilometers (4 miles). "The European mountain cryosphere: a review of its current state, trends, and future challenges"
as well as their past, current, and future evolution. altitudes, and the snow season will be much shorter than today. runoff regimes from glacial to nival and from nival to pluvial. a need for adaptation to climate change will arise. Why do they always say "by the end of the century" when it is happening now and will get worse a long time before then? This was written by 25 scientists from 19 research institutions and 7 countries in Europe, therefore I presume this paper is a common ground between realistic scientists and conservative scientists/ institution. But surely climate change and environmental damage is already impacted the Alpes, and Scandinavian mountains right now. ..... few posts up is a piece about the tourist uptick at Glacier National Park, strange how different governments respond to similar stimuli. Oh!!! The fed gov't determines tourist destination numbers? Is that a "don't rump" policy? qs temperature continues to increase, artificial snow will be useless in most areas as it requires below freezing temperatures for several days for artificial snow to efficiently cover the slope. You.... you... you mean they won't be able to keep the "kiddy hill" in snow? Does that mean the hiking season will by 12 months a year....... 'cept during forest fires? BADSWAT, Pakistan, Aug 6 (Thomson Reuters Foundation) – When a glacial lake burst in Pakistan’s northern Gilgit-Baltistan province in July, Sher Baz watched helplessly as the waters swept away his family home. Pakistan has more glaciers than any other country outside the polar region – more than 7,200 in the Karakoram, Himalayan and Hindu Kush ranges, according to the Pakistan Meteorological Department (PMD). They feed the Indus River system, the country’s water lifeline. But data gathered over the last 50 years shows that all but about 120 of the glaciers exhibit signs of melting, due to rising temperatures, meteorological officials said. As the glaciers retreat, they leave behind lakes supported by ice dams or accumulations of rock and soil. Inherently unstable, these dams often burst, sending huge volumes of water rushing into the villages below them. Not as bad as 2003, but the trend is clear. Article has regional details and several references to recent publications, including this gem: "Huss and Hock (2018) indicate that approximately half of 56 glaciated watersheds globally have already passed peak glacier runoff." " where rates of motion accelerated to 9125 ± 354 m/y ..."
"These results show that up until 2013 the glacier was strongly supported by the bed. By 2015, the bed can no longer support the driving stresses, which are predominantly supported by longitudinal stress gradients and lateral drag. An extraordinary transition from a high friction bed to a near frictionless bed has taken place over just two years." "There is, however, a general acceptance that ice caps in the polar regions will only respond slowly to a warming climate and changes in boundary conditions. Our observations indicate this assumption should be questioned, especially when glaciers can advance over low friction sediments. We show polar glaciers that have bed elevations above sea level can rapidly collapse." I shudder to think of something like Thwaites doing this. This is the sort of acceleration that would result in a 1m/decade sea level rise if repeated everywhere that is losing ice at the moment. Presumably IceSat2 will be able to produce data for a relief map for every glacier on the planet? Mountains destabilize & are collapsing for several reasons: 1) mountainous regions are warming faster than general AGW warming, 2) increasing underlying "permafrost" thaws are no longer able to resist the downslope force of gravity. Quoted in the article, "....global warming is dissolving the glue that holds mountains together", 3) increases in warm rainfall cause great leaps in de-stabilized mountain slopes. "A 633-foot-high wave that surged down a remote fjord in Alaska in 2015 was caused by 180 million tons of rock falling into the water. The massive quantities of unstable loose rock had been exposed as the Tyndall Glacier retreated over the past 50 years." In which part of Russia (probably on one of its Arctic Sea islands ?) is this Vavilov glacier/ice cap located? "We observe a fourfold increase in mass loss rates between 2000–2009 [ 2.9 ± 3.1 Gt yr 1 ] and 2009–2018 [ 12.3 ± 4.6 Gt yr 1 ]"
Thats a doubling period of about 9 yr.
"Our estimated rate of WNA mass change for the early period ( 2.9 ± 3.1 Gt/yr ) is considerably less negative than the rate ( 14 ± 3 Gt/yr) previously reported for the period 2003–2009 (Gardner et al., 2013)." "Using available SMB measurements for 14 glaciers in WNA (supporting information S1), we calculate an average mass change of 874 ± 100 kg m^2/yr over the period 2000–2017. When multiplied by the total glacierized area of WNA, this value yields an annual mass loss of 13.6 ± 4.3 Gt/yr , close to the value (14 ± 3 Gt/yr ) calculated by Gardner et al. (2013) using a similar approach. These values are twice as large as those based on our trend analysis. This discrepancy suggests that glaciers chosen for long-term monitoring programs are losing mass more rapidly than the region as a whole." Open access, read all about it: Menunos et al doi:10.1029/2018GL080942 . Pelto is an author as might be suspected. Can you comment on that caveat, because it appears that there is no change between the two time periods, using the rates calculated by Gardner, et. al. It seems Gardner used less accurate methods than those available now. A global assessment of glacier mass change by Gardner et al. (2013) included an estimate of WNA glacier mass loss of 14 ± 3 Gt yr−1 for the period 2003–2009 based on the extrapolation of sparse in situ surface mass balance (SMB) measurements (Cogley, 2009). Other approaches to estimate glacier mass change, such as satellite laser altimetry and satellite gravimetry employed by Gardner et al. (2013) for other glacierized regions, have so far proven unsuccessful for WNA due to sparse repeat‐track spacing at lower latitudes and challenges associated with deconvolving competing mass change signals (groundwater, seasonal snow, reservoir volumes and glacio‐isostatic adjustment). Such methods perform particularly poorly for lower‐latitude mountain ranges with disperse glacier coverage, such as those that characterize WNA (Gardner et al., 2013; Jacob et al., 2012). Repeat mapping of surface elevation through stereophotogrammetry provides an additional approach to measure glacier thickness change on a regional scale that can circumvent spatial and temporal biases imposed by using SMB observations to estimate regional mass change. Geodetic surveys exist for many glacierized regions of WNA (e.g., Basagic & Fountain, 2011; Schiefer et al., 2007), but no study samples all of these regions in a systematic fashion. Novel methods to infer elevation change from medium resolution satellite imagery (Brun et al., 2017) coupled with automated processing of both medium and very high resolution optical satellite imagery (Noh & Howat, 2017; Shean et al., 2016) provide new opportunities to improve global estimates of glacier mass change. The primary motivation of our paper is to provide the first, regionally complete estimate of glacier mass change for WNA for the period 2000–2018. We then use these data to (i) quantify the contribution of WNA glaciers to sea level rise over the last 18 years, (ii) determine the reliability and representativeness of existing WNA in situ SMB records, and (iii) assess the climatic drivers that affect mass change at the subregional scale. Are comparable values available for the 1990s or even the 1980s? If the acceleration were constant through the last 40 years, the mass los rate should have been around 0.7 Gt/y in the 90s and around 0.17 Gt/y in the 80s. Researchers have provided a new estimate for the glacier ice volume all around the world, excluding the Greenland and Antarctic ice sheets. Their conclusion: previous calculations overestimated the volume of the glaciers in High Mountain Asia. Led by ETH Zurich and the Swiss Federal Institute for Forest, Snow and Landscape Research WSL, an international team of glaciologists used a combination of different numerical models to calculate the ice thickness distribution and the ice volume of some 215,000 glaciers around the world. The researchers excluded sea ice and glaciers that are connected to the Greenland and Antarctic ice sheets from their calculations. According to the study, the combined ice volume of all considered glaciers currently amounts to some 158,000 cubic kilometres (km3). The last available estimate - dating a few years ago - was around 18 percent higher. The largest glacier ice masses (some 75,000 km3) are found in the Arctic and account for almost half of the global glacier ice volume. They include glaciers in both the Canadian and the Russian Arctic - such as those found on Baffin Island and the Novaya Zemlya archipelago - as well as glaciers along the Greenland coast and the Norwegian island of Spitsbergen. ... "In light of these new calculations, we have to assume that glaciers in High Mountain Asia might disappear more quickly than we thought so far," says Daniel Farinotti, Professor of Glaciology at the Laboratory of Hydraulics, Hydrology and Glaciology (VAW) at ETH Zurich and at the WSL. Previously, researchers had estimated that the area covered by glaciers in this region would halve by the 2070s.This is now expected to happen in the 2060s - with perceptible consequences for local water supplies. The glaciers of High Asia, in fact, feed into large rivers, including the Indus, the Tarim and rivers feeding into the Aral Sea. Hundreds of millions of people depend on them. For the above regions and depending on the model, researchers expect summer meltwater volumes to be as much as 24 percent lower by the end of the century as they are today. “This difference is unsettling. "In the space of just two weeks, two large icebergs broke off the Grey Glacier in Chilean Patagonia—a sign of accelerating climate change, experts say. The Grey Glacier is one of the main sights in the Torres del Paine national park popular with tourists and hikers. A giant iceberg the size of six football pitches—8.8 hectares (22 acres)—broke away from the glacier on February 20 and another six hectare piece detached on March 7. It marks the first time two icebergs of such great size have broken off in such quick succession. The 270 square kilometer (104 square mile) glacier receded by 500 meters (550 yards), more than half the amount lost over the previous decade. A smaller iceberg detached in 2017 but Ricardo Jana, a scientist at the Chilean Antarctic Institute, said "the loss of mass over the previous years was definitely smaller than this year." Scientists following the glacier's evolution say it lost around two kilometers in the last 30 years. A United Nations study in 2018 found that 95 percent of Chile's 24,100 glaciers had receded. Scientists say that unusually warm summer temperatures—up to 31 degrees Celsius in Patagonia—and high rainfall weakened the glacier's walls. "The receding of the glaciers coincides with the increased temperatures that we've noticed in the region," said Inti Gonzalez, a glaciologist at the Cequa Foundation that studies geology in Patagonia and the Antarctic. Higher rainfall also accelerates the glacier melt while raising the level of the eponymous lake where the glacier is found. This is not big by Grey standards. In 2017, a chunk measuring over 13 hectares broke off. This glacier may be returning to the time of glacial recession and large iceberg calving of the 1990s, when the glacier was losing mass and receding. Since 2000, the Grey glacier has experienced a net mass balance gain, with no large calvings. 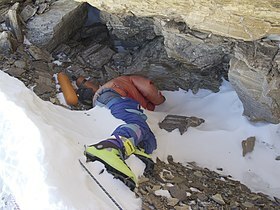 Expedition operators are concerned at the number of climbers' bodies that are becoming exposed on Mount Everest as its glaciers melt. Nearly 300 mountaineers have died on the peak since the first ascent attempt and two-thirds of bodies are thought still to be buried in the snow and ice. "Because of global warming, the ice sheet and glaciers are fast melting and the dead bodies that remained buried all these years are now becoming exposed," said Ang Tshering Sherpa, former president of Nepal Mountaineering Association.